Fangirl has been on my TBR for ages – ages, I tell you! The moment I knew fan-fiction was involved, I just had to get myself a copy. I used to read a lot of fan-fiction myself years and years ago. Seeing it incorporated in a book.. Well, let’s just say I was curious to see how it would play out. Perfectly – that’s how it played out. I love how Rowell succeeds at showing fandom-love in her novel. As in I Was Born For This, Fangirl shows what a fandom can mean to someone, albeit in a whole different way this time. Although I’ve only ever been a real part of the Harry Potter-fandom, I do think we are all part of the general book-fandom which makes us relate to the subject in a whole new way. I understood why Cath felt like losing herself in that fictional world of Simon and Baz. I understood why she’d rather write and dive into her own story than be confronted with her real life. Admittedly, that’s not the healthy way to go about things, but I understood. A huge part of that is her anxiety disorder, which was done beautifully – even if I do say so myself. I could be wrong and, if so, please do tell so I can adapt this. It’s a huge theme in this book and I loved that. It’s important, it always will be. It made me feel as if I completely understood where Cath was coming from. 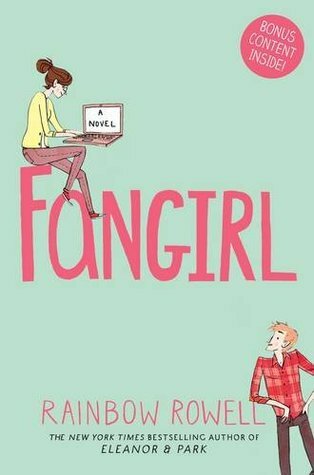 You all know I’ve already read some books featuring anxiety, but none of them compare to Fangirl. Underneath this veneer of slightly crazy and mildly socially retarded, I’m a complete disaster. Apart from that, I loved all the characters. Each and every single one of them felt unique, felt fleshed out and I bloody loved it. I love how Cath has to find herself, how she slowly has to grow into accepting strangers into her life, how side characters have such distinct voices and characteristics. They don’t blur together, not even a tiny bit! And that’s not even mentioning the slow, slow romance building up along the way. I’m not spoiling anything by saying names – not doing that – because the whole thing is about not knowing how this novel will end. Honestly, guys, if you need a book without insta-love, just pick this one because I just know you’ll love it. You give away nice like it doesn’t cost you anything. Writing? Being over 450 pages, I still read this novel like it was only a 200 page book and that’s saying a lot. I flew through it, I didn’t want to stop. I actually didn’t stop when it was 11.30 pm and I had to sleep but couldn’t put it aside. I needed more. Needed more Cath, needed more Wren, needed to know what would happen next. Not to mention my curiosity when it comes to the fan-fiction. I don’t own Carry On and I’m on a book buying ban, but.. seriously. Can someone just send me a copy so I can read it already?! I NEED IT IN MY LIFE. Do you really think I’m going to put anything in this part of my review? No way! GI absolutely love this book with my entire heart. I can’t say a bad word about it and I really, really want to read Carry On. I’m even going as far as saying this is the newest addition to my favorites-shelf on Goodreads! Have you read Fangirl? What did you think? Any of you read Carry On? Is it as good as this one? If you haven’t read either of them, are you planning on it? I have this book on my shelf since forever, but keep procrastinating it for various reasons. You know, like, oh it’s not scary, oh it’s spooky season, etc. Haha, nothing should get in the way of spooky season though. Even I find myself grabbing more fall-feeling books lately. I’m leaving IT to fill my spooky needs because I don’t think I need more than that one, haha. Yay! It makes me so excited to see Fangirl get love! This book is one of my favorites (and by that I mean I own 7 copies of it). I’ve re-read this one countless times. Carry On has a different vibe but is also AMAZING and I can’t wait for Wayward Son to come out in 2020! Seven copies? WOW, haha! I did notice there are a lot of different editions out there though. I can totally imagine the urge to get them all if it’s a favorite! Great review! I’m planning to read this before the end of the year, and actually this one and Carry On are the only Rainbow Rowell books I haven’t read yet. But I wasn’t as thrilled with Landline and Attachments so I’ve been putting Fangirl off. I’m looking forward to it more now! I’m reading this one in the car right now via audiobook. The audiobook quality leaves something to be desired (I could have done a better job of editing the audiobook when I was a senior in college) but so far I think the book itself is great. I’m a fanfiction author, so I knew I had to read this book. Cath has WAY more fans than I do, LOL. The fandom has more followers in general than the ones I write for. I stumbled across this book in Target not long after it came out. Bought it for my older girl because we were getting ready to take a road trip. My older girl read it on the way down, my younger girl read it on the way home! Me? Um… yeah. IT’S ON THE TBR! YAAAAAAY! I’m so glad you loved this. I used to love reading fanfiction too, and I thought it was a really cool portrayal not only of fandom, but of what it’s like for Cath to be the writer and not just the reader. I remember when I read this, I think I stayed up until about 4am because I couldn’t put it down too! :’) I’m not sure how interested I am in Carry On, though, because the only thing I didn’t love about it was those segments.